The discovery was made during an analysis of the parasitic plant Viscum scurruloideum, a species of mistletoe whose apparent ability to survive and thrive without several genes involved in the primary energy-producing pathway of oxygen-respiring organisms could make it one of the most unusual plants on Earth. The results are reported in today's issue of the journal of the Proceedings of the National Academy of Sciences. "This loss of genes very likely corresponds to the loss of an entire respiratory complex," said Jeff Palmer, IU Distinguished Professor in the IU Bloomington College of Arts and Sciences' Department of Biology, who led the study. "This is something that hasn't been reported before for any multicellular organism." The genes that have been lost from V. scurruloideum typically reside in the mitochondrial genomes of plants and animals. Mitochondria play an important role in the overall metabolism of cellular organisms, serving as generators that produce energy to power other functions of the cell through respiration. Contained within all eukaryotic cells, mitochondria possess their own DNA due to their evolutionary history as an "enslaved" bacterium swallowed up billions of years ago by a primitive eukaryotic organism. Biologists regard the mitochondrial genomes, or mitogenomes, of flowering plants as "extreme and often perplexing" in their wide range of sizes, structures and mutation rates, Palmer said. But this genetic diversity has never before been shown to include the loss of genes involved in the mitochondria's primary genetic function of respiration. In addition to the loss of these genes, the V. scurruloideum mitogenome shows other signs of degenerative evolution, such as miniaturization and an accelerated mutation rate. This strange "de-evolution" may be related to the mistletoe's status as an obligate parasite, meaning it requires a host plant to complete its life cycle. "This plant has taken a unique overall tack in evolution, presumably related to its parasitic lifestyle," said Elizabeth Skippington, a postdoctoral fellow at IU who is first author on the study. "Whether cause or cure, parasitism is most likely at the root of its extremely small mitochondrial genome, which shows clear signs of both rapid and degenerative evolution." Specifically, Skippington said the V. scurruloideum mitogenome had lost all nine mitochondrial genes encoding respiratory Complex I, a principal component of the main energy-producing pathway in aerobic organisms. Yet the loss of this complex has not dramatically affected the capacity of the plant to produce energy. "The loss of these genes is highly unexpected," Skippington said. "Over 300 other flowering plants have previously been examined, and Complex I is present in every single species. Presumably, V. scurruloideum's parasitic lifestyle has allowed it to survive and thrive regardless of the absence of these genes." Although in rare cases mitochondrial genes may be transferred to the nucleus of a cell, she said the IU team found no evidence to suggest this is the case in V. scurruloideum, and that further investigation will be required to reveal the exact mechanism through which the species compensates for its missing genes. The IU scientists discovered the unprecedented lack of Complex I in a multicellular organism during a larger project to expand the number of parasitic plants that have undergone mitochondrial genome sequencing. Previous analyses of the mitochondrial genomes of parasitic plants were limited to Rafflesiaceae, a small family of parasites famous for possessing the largest flowers in the world. To expand knowledge about parasitic plants, the IU team chose to sequence the mitochondrial genomes of Santalales, more commonly referred to as mistletoes, which are the largest order of parasitic plants in the world with over 2,000 species. Some parasitic members of Santalales attach to the roots of other plants to feed; others attach to stems. An aerial parasite, V. scurruloideum attaches to the stem of its host plant to derive nutrients for survival, and its general appearance is familiar to anyone who has ever stood under mistletoe during the holiday season. Despite their familiar role in Christmas traditions, however, Palmer said the broader ecological importance and prevalence of mistletoes across the world is commonly unrecognized. 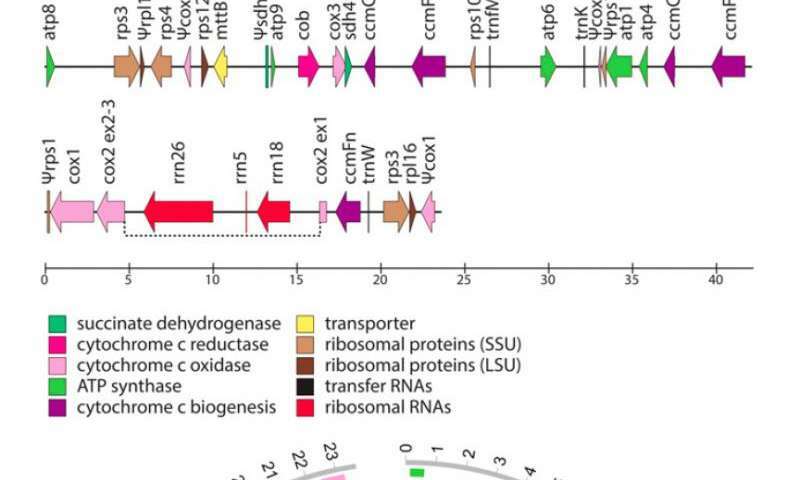 "The mitogenome of V. scurruloideum has proven an unexpected goldmine of surprises, setting new benchmarks for the extremes of genome size, gene content, protein divergence and other biological mechanisms," he said. "We expect further investigation into this family of plants, as well as other parasitic flowering plants, will provide even more significant insights into the evolution and function of parasitism in plants." so lets take a germ and add a 'normal' mitochondrial genome in and see what happens... if it bites you it's your own fault.